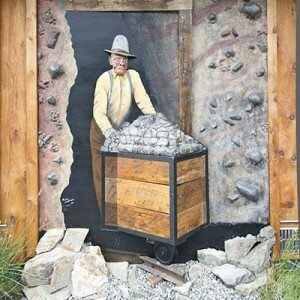 In 2011, the Silver Mine on Chemainus commissioned local artist Terry Chapman to construct a 3-D mural. 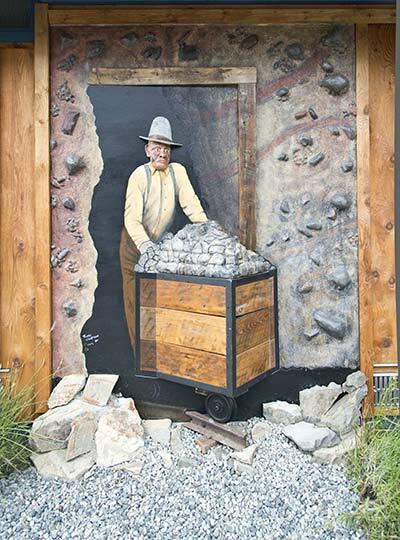 The mural depicts a scene from Lenora Mines, nearest the base of Mt. Sicker; the local miner emerging from the mine’s black tunnel. His face and hat are cast in Hydro-Stone, a hard and strong gypsum cement. The life-size mining cart, built of wood and steel, protrudes 45.72 centimetres (18 in) from the mural. Sounds of a distant past echo from above, adding to the authenticity of the viewing experience. Mt. Sicker was a source of three mines, mining copper, silver and gold. The total amount of ore mined, mostly copper and largely extracted by hand, was 207.75 tonnes (229 t). A fire at Lenora Mines was a mixed blessing – the burned area revealed a 9.14 metre (30 ft) wide outcropping of copper at the mountain’s 426.72 metre (1400 ft) level. The mine ceased operation in 1907.